Artist Tony DeLacugo has some amazing work on his website. 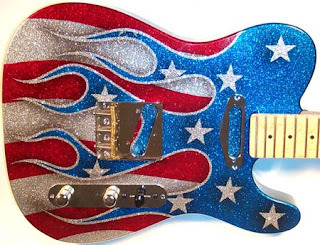 check out his amazing sparkle paint jobs here, and look at available guitars here. Bookmark this page and CLICK HERE from time to time to see when he is selling painted bodies. Tony tells me he’ll be selling more on eBay in a day or two. Speaking of sparkly guitars, check out this Carvin DC747 7-string on eBay. At the time of writing there are 13 hours to go on the auction, with no bids. Specs include: Alder Body, neck thru, ebony fretboard 24 frets, gold hardware, abalone block inlays, stock pickups, 6100 fretwire, locking tuners. I’ve never seen a Carvin with this finish before. WANT! If anyone who reads this site happens to buy it, let us all know what it’s like! Next → Next post: NEWS: First Chickenfoot music! The name of the Carvin’s finish, as listed in the title, is “Harlequin Prismatique” and is in the same genre of finishes as John Petrucci’s “Mystic Dream” Signature finish (“flip-flops”) but with large flakes that keep it much more “rainbow” and not shifting from one color to another like the Petrucci. It was available from approx. ’98-’02, but much like what I’ve heard about MusicMan discontinuing metallic-and-sparkle finishes, the combination of difficulty to shoot plus lack of desire led to it’s demise.